Whatever the current VB ads might have you believe, beer is anything but an exclusively male world. Look around the bars and breweries of Australia and you’ll find female brewers and bar owners, Beer Diva-hosted beer dinners, female beer bloggers and an audience at beer appreciation nights like Ale Stars split almost 50/50 between men and women. Heck, Mrs Pint’s only real craving as we await the arrival of the Crafty Pot is for beer (so we now know the reason for the alkoholfrei German stuff). Among the ladies leading the way Down Under is Nardia McGrath, part of the Bridge Road team up in Beechworth, in Victoria’s north. 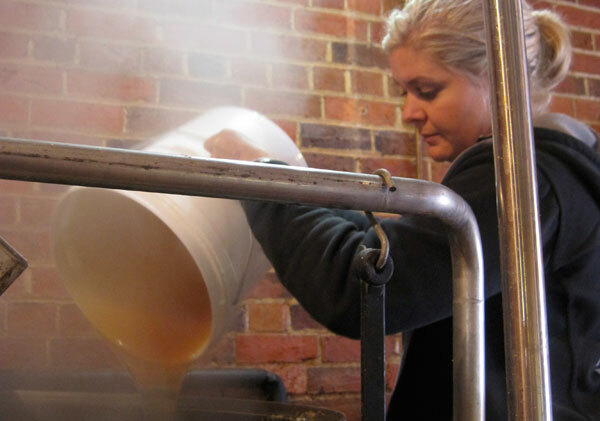 She announced herself quite spectacularly by choosing to make a 10% braggot as her first beer for the brewery – a seldom seen style that originates in Medieval England and is made with huge amounts of honey and, in this case, spices. She also writes her own beer-related blog, Femme Fatale Ales. Favourite Australian beer (other than your own)? Really? Do I come across that egocentric? Actually, yeah I do like my beer best. Just kidding. Unfortunately, living so far away from the big smoke, I don’t get to try as many new Australian beers as I would like to. I occasionally raid (Bridge Road founder Ben) Kraus' stash and am always impressed with the quality of beers coming out in this country. Anyway, to finally answer the question, I really enjoy Murray’s ‘Grand Cru’. I love my Belgian style beers. I remember really liking Matilda Bay’s ‘Barking Duck’ too, but that was a while ago now. Epiphany beer â the one that set you on the road to becoming a brewer? No beer will ever come close to tasting as good as my first Leffe Blonde. Not even another Leffe Blonde. My first Leffe was a taste explosion. I couldn’t believe beer could taste that good. About a year later I was set on joining the beer industry. Desert island beer â the one to keep you going if you were stranded for the rest of your days? I guess Dogfish Head’s 120 minute IPA would be the one. Probably not the most thirst quenching beer, and no doubt I would be asleep after a few, but it’s a pretty damn good beer. Favourite beer and food match? I have quite the sweet tooth, so I would have to go the dessert option. Gueuze with Lemon tart. Delicious! What are we likely to hear cranking from the stereo on brew days? If I had my way it would be 90’s Grunge, Punk and a lot of ‘Tool’ but unfortunately I work in a brewpub, so I have to listen to customer friendly music most of the time. I’ll admit, there’s been a couple of Jazz CDs that have gone “missing” because I’ve heard them one too many times. When we’re closed it’s usually Triple J; then there’s no fighting over the stereo. Favourite place to enjoy a drink? In the shower. You know you love it too. If you were a beer style, what would you be? The best thing you’ve ever traded for beer? I do believe I’ve traded my dignity on one or two occasions. Can’t really think of anything off the top of my head, but last night I gave a guy a beer for driving me home. So happy not to have to walk home in heels. Especially up and down Beechworth’s hills. Looking after Puppyman, a 5 month old Blue Heeler with boundless amounts of energy and inclination to chew on anything my mother has leant me. Still, you gotta love him. 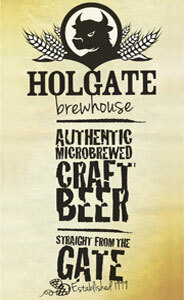 Your hope for beer in Australia? I want to see more female craft beer drinkers. I really hate seeing women (or men, for that matter) screw up their noses and say they don’t like beer. I bet I could find just about anyone a beer they would enjoy. It’s just a matter of trying new things.